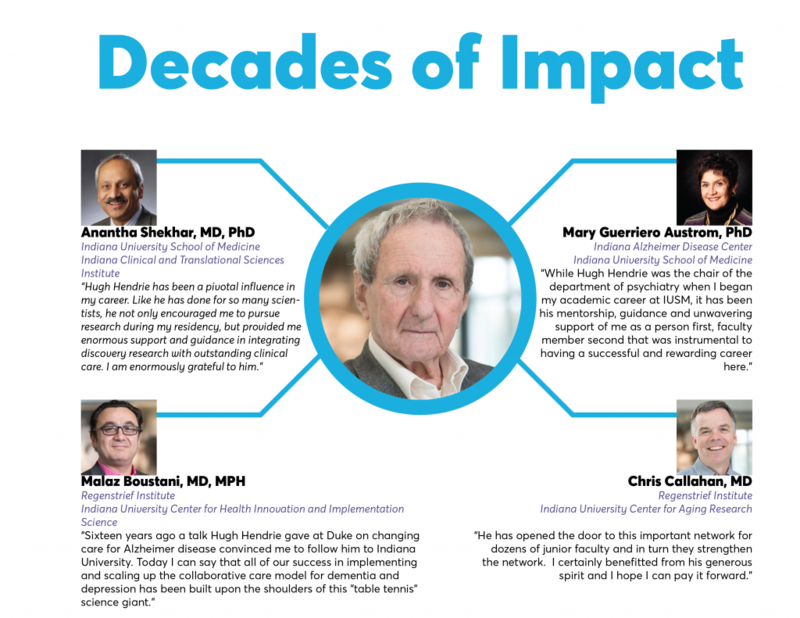 Two decades ago Indiana University Center for Aging Research center scientist and Regenstrief Institute distinguished research scientist Hugh Hendrie surveyed physician retirees and spouses. He found that nearly 90 percent of the retired physicians and an equal percentage of the spouses were “mostly satisfied” with their retirement. In addition to remaining physically healthy, whether one is content in retirement has to do with a variety of factors according to Dr. Hendrie. These include maintaining good emotional health and a high level of psychological well-being consisting of finding meaning, motivation and purpose in life. Now after decades exploring emotional health and psychological well-being of older adults, Dr. Hendrie himself is retiring, or as he labels it, making his third career transition. He believes he is well prepared to relinquish the weighty mantle of an internationally respected physician researcher and don the more relaxed apparel of active retiree. A native of Scotland, he attended the University of Glasgow where he earned a medical degree and later received a Doctor of Science degree the first to be awarded by the School of Medicine. He also holds a diploma in psychiatry from the University of Manitoba and a master’s degree from Wayne State University in Detroit. Following positions in Winnipeg, Manitoba and in Detroit, Michigan Dr. Hendrie was named chairman of Indiana University School of Medicine’s Department of Psychiatry before he turned 40, leading a well-respected academic department and focusing his research on late life depression and dementia. As chairman he developed and directed a section of geriatric psychiatry, one of the first in the United States. After a quarter century at the helm of the Department of Psychiatry, a period in which he became an international leader in psychogeriatrics and the epidemiology of dementia, he transitioned to the IU Center for Aging Research and Regenstrief Institute, a professional move which enabled him to focus solely on research. Later he transitioned again — this time to a part-time IUCAR and Regenstrief appointment which allowed him to commence disengaging from many of his professional activities and to prepare for retirement. helping establish the first Alzheimer’s Disease clinic at IU Hospital. Dr. Hendrie is a past president of the American Association for Geriatric Psychiatry and the Geriatric Psychiatry Alliance and a fellow of the Royal College of Physicians of Canada and the Royal College of Psychiatry, as well as a distinguished life fellow of the American Psychiatric Association. He has received many awards during his professional career including the Sagamore of the Wabash from the State of Indiana (honoring his contribution to Hoosier heritage) when he completed his term as chairman of psychiatry and, most recently, in 2017, with a lifetime achievement award from the Alzheimer’s Association for his pioneering work on the impact of the interaction of genetic and environmental risk factors in determining dementia probability in a variety of populations. With his third transition in summer 2018 he is focusing on making retirement successful by exercising (see his pickle ball exploits below), remaining cognitively engaged (think competitive sports, reading, attending the theater) and engaging socially (with his family, at pickleball and table tennis clubs and other social and volunteer events). A former avid tennis player, Dr. Hendrie earned a gold medal in the 80-84 men’s doubles pickleball as well as silver and bronze medals in table tennis at the Indiana State Games in 2016. After a one-year absence he returned to the Indiana State Games in May 2018 medaling in men’s doubles and mixed doubles pickleball and qualifying for all pickleball events in his age group at the 2019 National Senior Games to be held in Albuquerque, New Mexico. When queried about specific plans for the future, the answer is, his major goal is to spend more time with his lovely wife Marguerite and their family of five children and seven grandchildren who are spread across the United States. Beyond that he’s not terribly sure, but he will be looking for other enticing opportunities. What he is certain about, he says, is that the most important thing will be to enjoy life as he takes things day by day.